Additional highly-efficient self-contained refrigeration unit stowed under the saloon table. Swedish built Malo Yachts are sought after cruising yachts, built under Lloyds Certification with limited production runs. Designed specifically for fast and comfortable passage-making, they feature an encapsulated keel. Her current owner sailed with the previous owners and when they decided to sell he was delighted to step in and buy her. 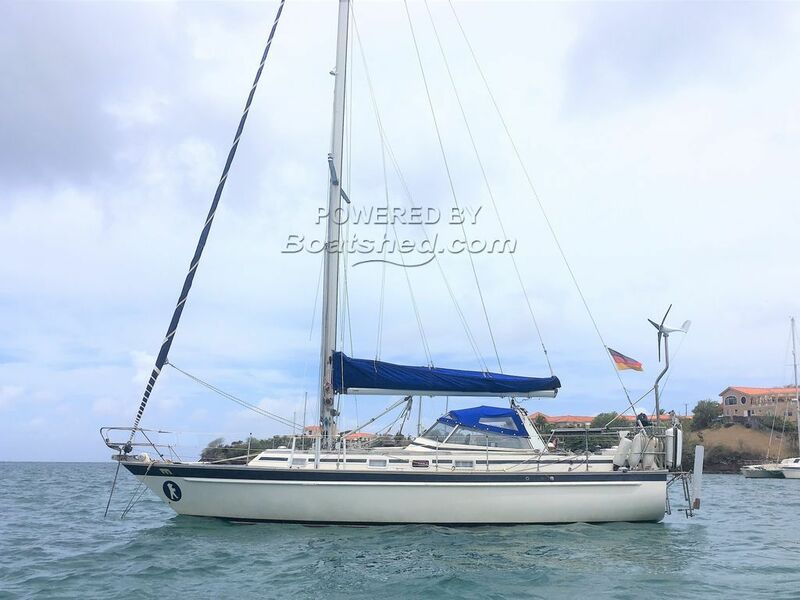 He is sad to sell as she has been the perfect Caribbean liveaboard boat but he needs to return to working life. She has been sailed single-handed, but would also work well for a couple or small family in terms of comfort and island cruising. She is equipped for self-sufficiency with dinghy and Yamaha outboard, additional self-contained fridge unit, Windgear wind vane steering system, and wind and solar battery charging. This Malo 106 2 Cabins, 1 Head has been personally photographed and viewed by Anita Sutton of Boatshed Grenada. Click here for contact details.